Makepung in local Balinese language means ‘romp’, is a tradition in the form of buffalo race which has long been attached to the culture of Bali, especially in Jembrana regency. This tradition was originally just a game of the peasants during the plowing activities at the harvest season. At that time, they are racing with a cart attached to a water buffalo and controlled by a jockey. Over time, that fraudulent activity was growing along with the number of people who love to watch and participate . Now, Makepung has become one of the most interesting cultural attractions and watched by many tourists. 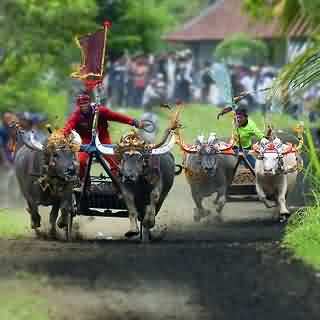 Moreover, this buffalo race has become an annual agenda of tourism in Bali and professionally managed. Today, Makepung not only followed by farmers. Many employees and employers from the city are also become participants and supporters. In a big race, Governors Cup, for example, participants who attended Makepung could reach about 300 pairs of water buffalo, and even more. The atmosphere was very festive with the presence of the Jegog musicians (Balinese gamelan, made of bamboo) to enliven the race atmosphere. Since the first contest held in the 1970s, rules and completeness in Makepung have been experiencing some changes. For example, previously there was only one buffalo which now become a pair. Then, the large cikar or wagon for jockey now replaced with smaller ones. The Buffaloes is now also more ‘stylish’ by the existence of various kinds of ornaments such as crown and buffalo head mounted on a green or red flags in each cikar. Meanwhile, the arena-shaped ground track Makepung form of ‘U’, as long as 1-2 km. Unlike Madura bull racing or other race event, Makepung has a few unique rules. The winner of this race is not only determined by which carriot managed to reach the finish line first, but also determined from the distance between participants. This means that a participant would be considered a winner if he had been at the forefront when reaching the finish and be able to keep the distance with the participants at the rear, as far as 10 m.
However, if the carriot behind the forefront carriot could narrow the distance to less than 10 m, that carriot will come out as winners instead. The race finished in a matter of eight to ten minutes in each of his race. Makepung fans and participants in Jembrana is divided into two groups known as the West Block and East Block. Distribution of this block based on the flow of Ijo Gading River which divides the capital city of Jembrana. The two blocks will meet in an official race every two weeks. And, each block has its own circuits used as the location of practice or formal competition. Unique things that make Makepung become an exciting and interesting spectacle, is the expression of a jockey above his carriot while he was giving spirit by shouting at the two buffalo with the yells from his block. The jockeys whip the buffalo with a stick during a race on the 2 meters width track to achieve maximum speed. Some jockeys also use special sticks where there are small spikes on it. So, it’s no surprise if the buffalo are bleeding after following the race. And just like any other race, the most waited moment is the accident. In Makepung, almost in every race there is always a jockey who failed to control the buffalo. This often happens when there are participants who will overtake the other participants. And, when the buffalo out of control, he will exit the track and fall into the plot of a wetland or got his carriot overturned. Best moment for the audience.